This showy snake of the moist lowland forests of eastern Asia is one of the larger rear-fanged snakes, adults reaching 8 feet in length. As in other such species, one or two teeth at the back of the upper jaw have become enlarged and sometimes grooved. The simple duct of a venom gland pours poison into the tissues at the base of the fang. Except for the largest rear-fanged snakes, these animals are not dangerous to man, but the poison is highly specific for their prey, whether crayfish or crab, fish or lizard, frog or bird. 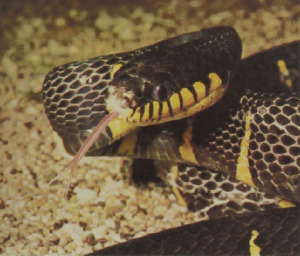 Mangrove Snakes can be poisonous to man, but their large size, beautiful coloration, and calm temper have made these arboreal snakes favored exhibit animals in many zoos.